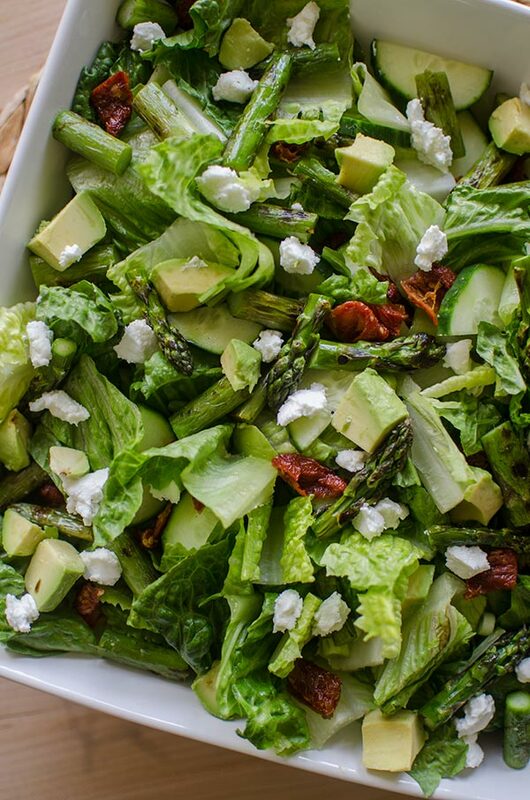 Grilled asparagus salad with basil vinaigrette is the perfect early summer salad with avocado, goats cheese and sun dried tomatoes. I had a realization today: I miss being surrounded by creative people. It’s something that I took for granted. This was a bit of an Oprah-style a-ha moment today, and I feel good about it. I’ve been trying to figure out why I’ve felt less inspired recently, and I think this is part of it. 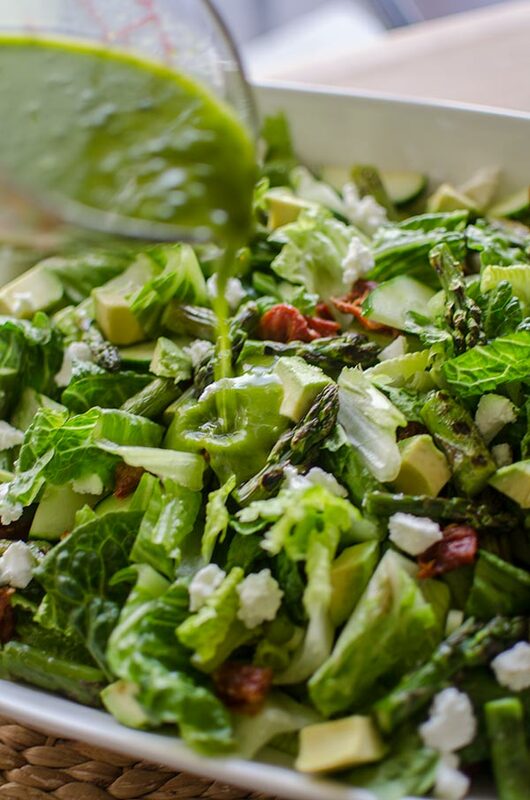 You may have noticed a slight silence on here, and the truth is, I’m happy, for many reasons, and in this moment, this grilled asparagus salad recipe is making me smile because it’s a recipe that I’m excited about. Film school (as all fine arts programs are) was a mecca for creativity. 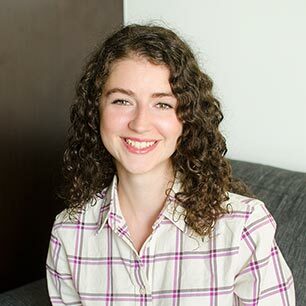 I still love thinking back to some of those classes, and the discussions, especially during my final year, in my intimate 10 person thesis class. Of course there were classes, projects and many moments that weren’t fun, but the energy and passion were palpable. We were there because we wanted to make something. After school, I worked in publishing. I spent a year working on the food team of a magazine, spending hours in the test kitchen, cooking, testing and brainstorming recipes. And when I wasn’t doing that, I was writing about food. This is a time I hold so closely in my heart. I know how lucky I am to have spent time working with a few cooks (who quickly became friends) who had so much passion for cooking. This is where I learned so much of what I know. Where my imagination was stretched and challenged. It was a job, but we were there because we wanted to make something. Then I worked in television. On the digital side. And it was fun and exciting and exhausting all at the same time. There was a constant creative challenge, and for a long time, I truly loved it. And now I work in a new industry and it’s good and challenging, in a different way from my previous jobs. But I miss my people. My artsy folks, because we are here to make something. And we know it, we understand each other. So, that’s why I keep showing up here, eight years later. I’m here to make something. And I love it. And while not everything fits together perfectly all the time, I’m a true believer that eventually it will. 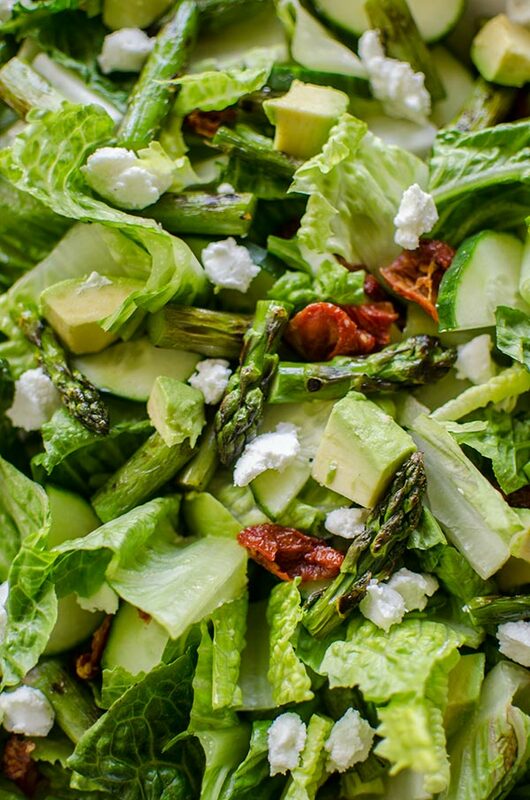 Today, it’s this fresh salad with sweet and grassy grilled asparagus, tangy goat cheese, savoury sun dried tomatoes and finished off with a bright basil vinaigrette (that doesn’t taste like pesto–please don’t add garlic!). Preheat barbecue to medium. Toss asparagus in olive oil in a large bowl and sprinkle with salt. Grill asparagus, turning often until lightly charred and cooked through, about 6-8 minutes. Set aside, when cool enough to handle, slice into 1" pieces. Meanwhile, in a large bowl toss romaine with lettuce, green onion, avocado, sun dried tomatoes, goat cheese and cooled asparaguws. In a blender, combine basil with olive oil, vinegar and salt. Toss with salad and serve immediately. Let me know if you give this grilled asparagus salad with basil vinaigrette a try in the comments below. Any suggestions on replacing the cucumbers? (Not a fan!) Excited to try it out! Thanks!